This is one of our principal products which is a complete ground reception and processing system for the Japanese Meteorological Satellites called Himawari 8/9 (GOES-R type satellites). The system can receive data, process and make it visualizations for professional users. 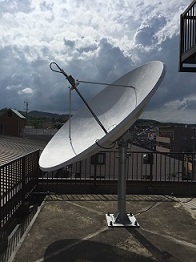 Observation data of a Himawari Satellite is disseminated through a commercial communication satellite called "JCSAT-2B" with free of charge for users. The data dissemination service is called as "HimawariCast". Himawari 8/9 satellite has 16 bands of sensors on the craft and carries out observations every 10 minutes for full globe. The HimawariCast broadcasting service contains 14 channels of Himawari data among 16 bands upon real-time bases. You can get full globe data of Himawari for visible band as well as 3 Near IRs, 3 Water vapor and 7 IR bands with every 10 minutes periods. This feature allows you to use various analysis capabilities. Weather analysis functions and capabilities could be dramatically improved thanks to the new Himawari 8/9 satellites. 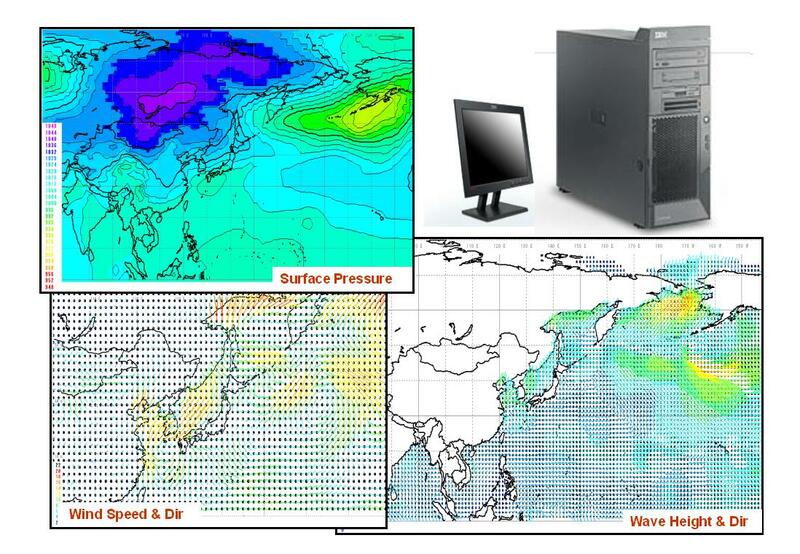 You can also get data other than Himawari imageries such as Global Numerical Weather Prediction products of JMA as well as Ground surface and Upperair observation data gathered from the GTS network and Ocean Surface Wind Data called ASCAT products observed by EUMETSAT METOP satellite. The system consists of components such as a 2.4m parabolic antenna, a DVB-S2 receiver, a reception/processing PC and visualization PCs. The visualization PC contains SATAID software which was developed by JMA. SATAID has multifunctional and very advanced capabilities to use for various range of weather analysis tasks. The imagery products generated automatically or manually can be disseminated to the users from the system over the network. The system is a low-cost but has very high-performance and essential capabilities for daily or emergency weather forecasting operations. There are many National Weather Services in the Asia and Pacific countries who are using our system. It is the most effective and vital tool for weather forecasting operations. 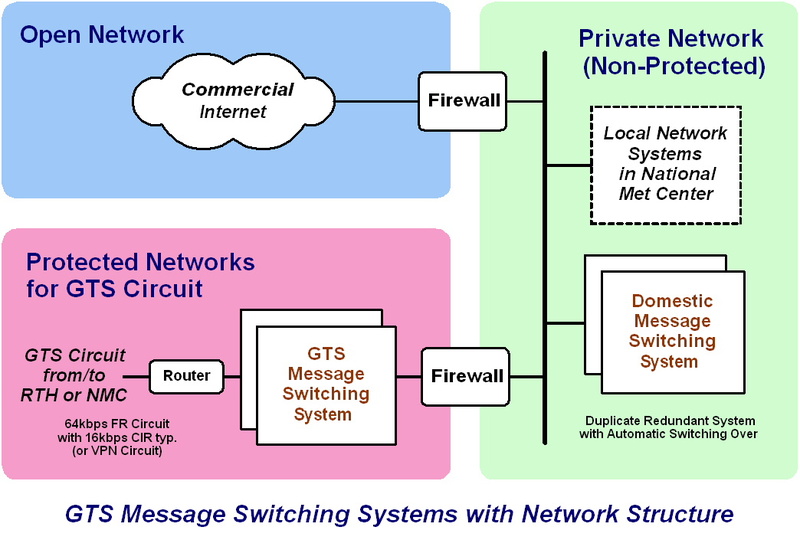 The GTS Meteorological Message Switching System is designated for National Meteorological Service connecting to the WMO Global Telecommunication Network to provide automatic data exchanging capabilities based on valid WMO message formats such as TDCF (Table Driven Code Form) and other standards. 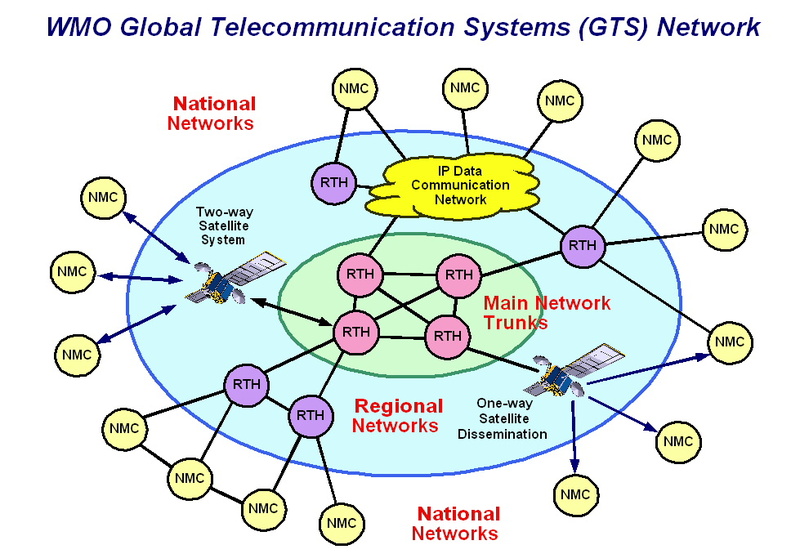 The system can handle various data such as real-time observation data, oceanographic data, aviation data, climate data, NWP products as well as early warning information sort of seismic, volcanic or typhoon/cyclone warnings on the GTS network. The system can also support our AWS observation systems to gather and transmit data to the GTS in compliance with WMO format and protocols in automatic basis. The system has very high performance data processing with non-stop full fault-tolerance capability with our unique and high-reliability software on a real-time Relational Database Management system. The system also has powerful client service functions enable to disseminate and gather data to/from domestic users based on the most up-to-date Internet/Intranet technology. 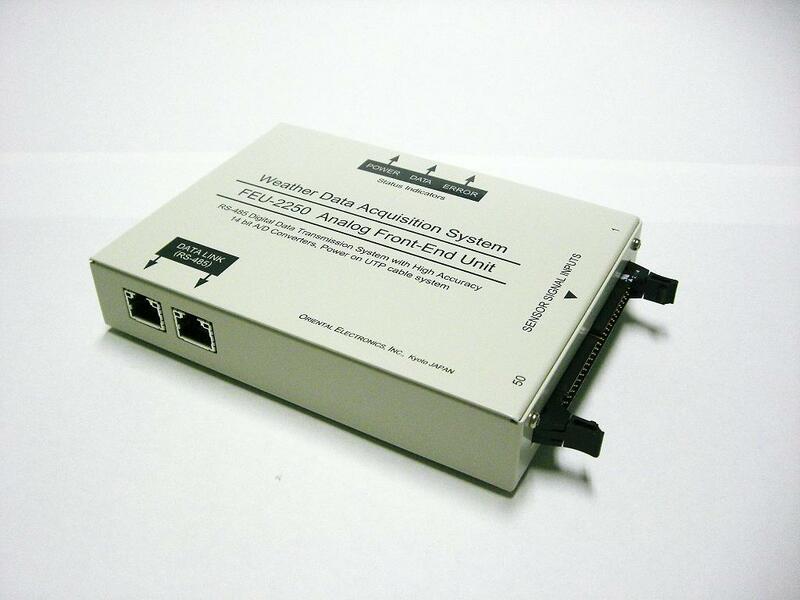 The WL-2250 is an AWS data logger with powerful networking capability connectable with various IP networks such as ADSL, FTTH, cellar, WiFi radio and satellite communication links. The logger consists of two parts as a Front-End Unit (FEU) and a main body wired with a regular UTP cable between them. Since FEU has built-in instrumentation interfaces, various sensors such as wind, temperatures, humidity, air pressure, precipitation or radiations can be connected to FEU directly. All sensor signals can be quantized by high-precision ADC, 10Hz each in FEU and transmitted to the logger via a UTP cable. The logger can make linearization of sensor data and primary statistical processing such as mean, max/min, time of occurrence, standard deviations and etc. Data shall be recorded based on BUFR format in the logger and transferred to the host server through various IP networks. GPS receiver can be mounted on the logger and enable to use accurate time and location information. The logger operates with DC12V low power. 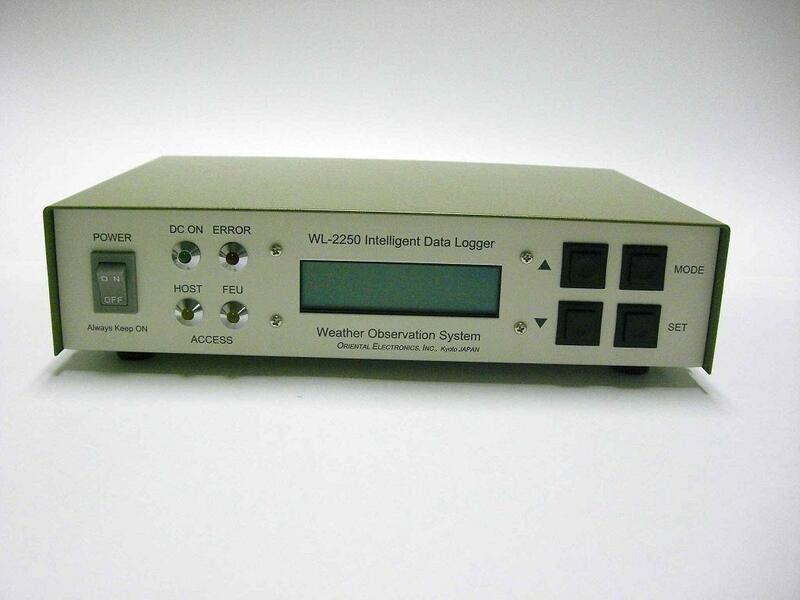 This data logger is designated for using data collections at the simple Precipitation observation site. The logger receives pulse output from the tipping-bucket rain sensor and record data upon the occurrence of an event as time series of the year, month, date, hour, minute and second into a built-in memory chip in a logger. The logger also supports the networking capability to connect with Internet or the cell-phone networks like GPRS, GSM, WiMAX, LTE or etc. The logger can record event data for 5 years continuously with a built-in lithium battery but external power supply shall be necessary when the logger uses a network connection to gather data via online. The data acquisition unit (DAU) can be used to collect data from the Precipitation loggers up to 20 observation sites per unit. The data server at the host center can also gather data from individual observation sites directly, of course, but more variety of circuits and protocols can be available to use if the DAU were used to gather data indirectly at the host center. DAU also supports the compatible data format as the case of the AWS data logger. This system collects weather information and emergency information through a variety of networks including ground cable networks, cell phone and communication satellites. 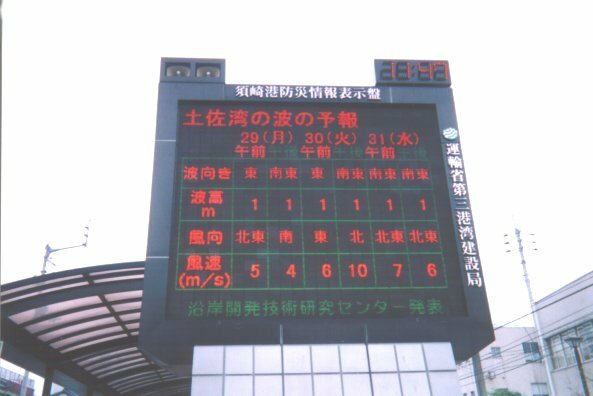 The information is promptly displayed on large LED displays both indoors and outdoors to be utilized publicly or privately. Still, scroll and motion display effects are available for all the text data and graphical data. The system is configured with a clear and easy view full-color, 3-color or monochromatic display. This system automatically selects the on-line real time information to be displayed, such as weather information and emergency message including earthquake / tidal wave / meteorological warnings, according to the situation. Every model of the system, indoor and outdoor, shares outstanding stability and long life. This system is applicable to wide variety of purposes for it accepts various types of on-line information such as news reports, market information, stock / exchange market information, not to mention disaster prevention. This system can be equipped with the Loudspeaker System (option).